I live in Singapore, I need sunscreen every day. Alas, I came to the conclusion a little too late to prevent all the sunspots on my face and arms. I suppose, with my skin this fair, purposely putting on suntan oil and baking on beaches didn’t really help either. The follies of youth. It’s the one thing that I never do without, even if I go out without moisturiser, I have to have my sunscreen. Because it’s the first thing, or close to the first thing that I put on my skin, I prefer that the sunscreen I use is a natural product, or at least paraben-free. Yes, I know all about the controversy over parabens, but it’s a personal preference, bear with me. I used to use the Neutrogena Ultra Sheer Liquid sunscreen, went through bottles of it, until one day, I couldn’t find it in stores anymore. Reason why I used that particular one was because it was the only paraben-free moisturiser I could find in the drugstore in Singapore. Granted, I didn’t really explore the options at departmental stores, but I didn’t really relish having to track down to a Robinsons or Sephora every time I ran out of sunscreen. 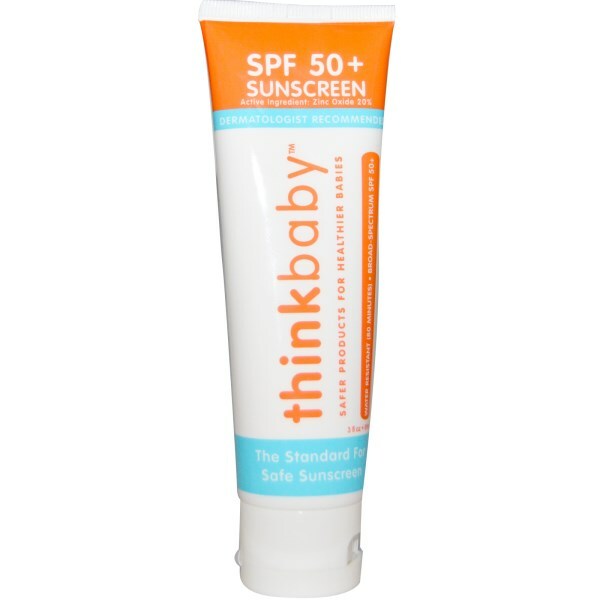 So off I went, clickity clicking on my laptop and reading tons of reviews of different products on iherb and I found Thinkbaby SPF 50+ Sunscreen. Lots of good reviews and me thinking, if it’s good enough for babies, it’s definitely good enough for me. It is also cheaper than my Neutrogena. So I ordered it. Verdict. I like it, I don’t love it, but I’ll continue using it until I find something better. Why? Smell – it smells really nice, like oranges. Feel – now, this is where I have to points off, because it’s thick and I can feel a layer on my skin. Even now, as I’m typing this, I can feel it. That said, it doesn’t affect my make up in any way, so that’s definitely a plus. When I powder it down, the slight tackiness goes away. Look – it does go on pretty white, but it quickly fades away to nothing. I can’t say anything about flash backs because I haven’t taken any photos that requires flash so far. If you’re looking for a natural sunscreen, this is a good option, just maybe wash your hands after application, if you don’t like the feel of an extra layer of something on your hands. Previous Post Why Stay in a Private Villa in Bali?